If you haven’t heard it yet, beef cheeks is the new tenderloin when it comes to food trends! OK, I may be making that up, but being a big foodie I do follow food trends. One of the major 2014 trends was eating meats from nose to tail and I really think this particular trend is going to continue in to 2015. So you’re probably wondering, what do beef cheeks have to do with my story? Well, I’ll start at the beginning. 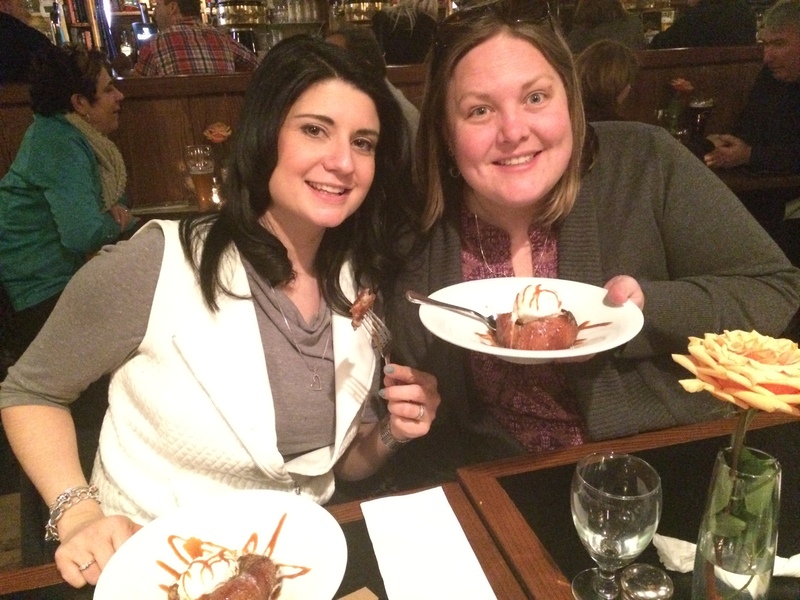 I met up with three girlfriends, Emily, Katie and Natalie, last Friday at the Black Dog in Bayfield for dinner. I was super excited to have a nice dinner and catch up with friends, so I hadn’t even remembered to look at the Taste of Huron menu before I left home. When I entered the restaurant, the familiar amazing smells delighted me. To top it off I ran into one of the owners, Kathleen, and she highlighted the Taste of Huron menu with delight. Katie and Emily read the menu and said “beef cheeks?” with a bit of concern on their faces. I explained that these tender meat morsels would excite their taste buds and that they would like the food. So they both decided to try the meal, which is three courses all for $32. 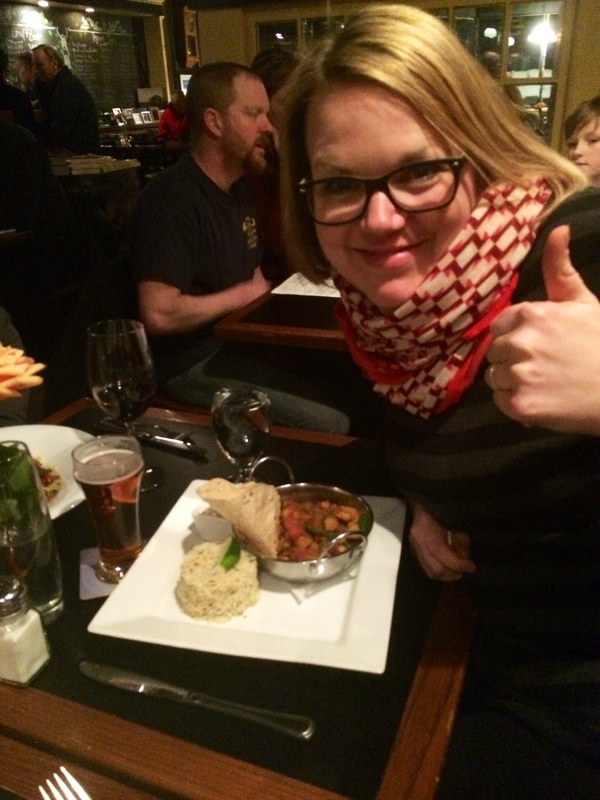 Nat skipped out on the special and went with village salad ($8.25) and vegetable curry ($16). 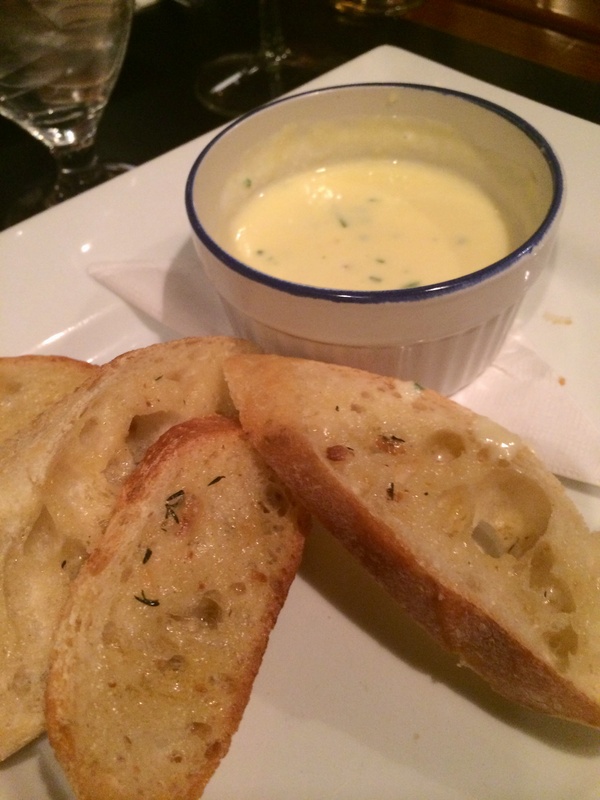 The first course of the Taste of Huron dinner was Cheese Fonduta with Roasted Garlic Crostini. I thought this course would be kind of like a Swiss cheese fondue and it was, but way better than I have ever been able to make! The garlic buttered bread dipped in the cheese was a mouthful of dancing rich flavours that I never wanted to end. 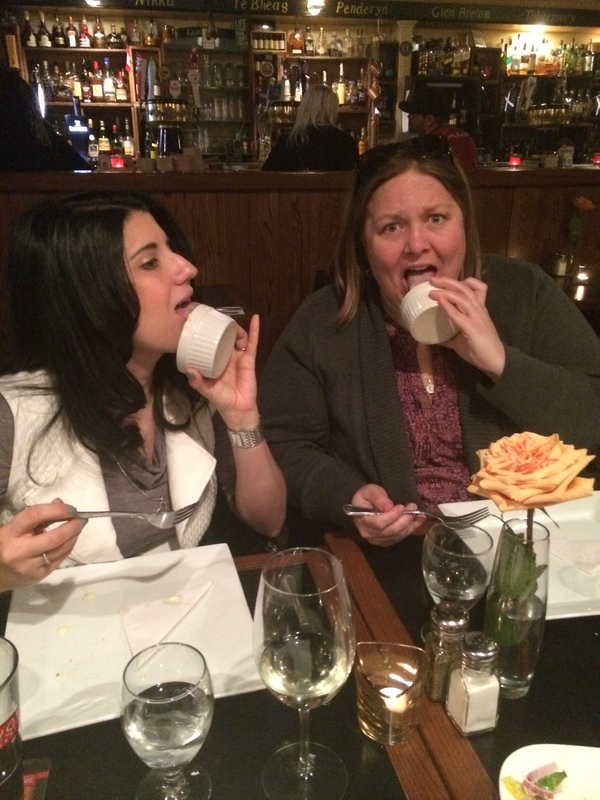 As you’ll see below in the photos, Emily and Katie couldn’t get enough and licked their cheese fonduta ramekins clean. I’ll also note that the photo was not posed, I looked up and they were both pretty much trying to drink their cheese. 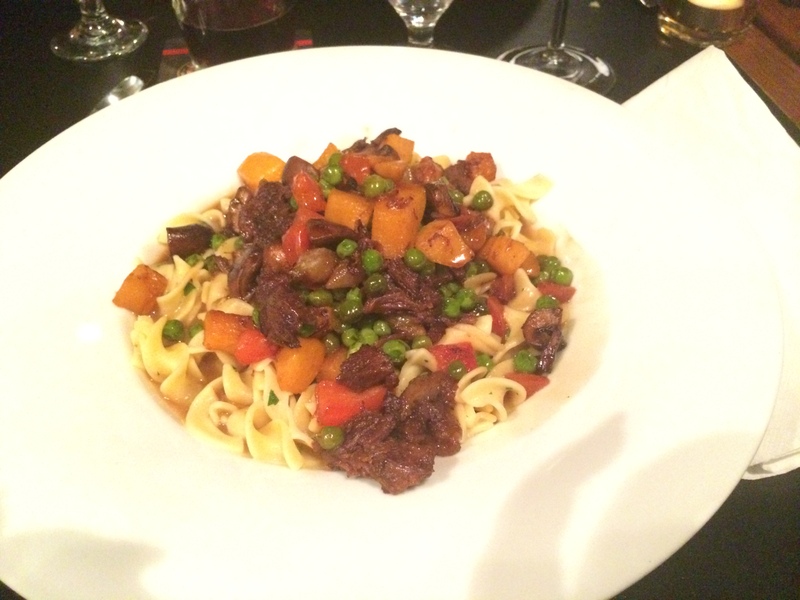 The next course was Braised Beef Cheeks with Winter Vegetables and Parslied Egg Noodles. Yet again, the chef did not disappoint. The meat was extremely tender and the sauce mixed with noodles and vegetables made it a complete meal. For dessert, we had Apple Fritter with Vanilla Ice Cream and Butterscotch Sauce. This was no ordinary donut! Essentially it was a whole apple covered in smooth pastry and loaded with ice cream and butterscotch. An excellent end to a great meal! This menu also highlighted wine pairings to go with each course, which Katie and I tried. Both Emily and Natalie selected beer from the 20 on tap at the Black Dog. We had a wonderful evening and left the restaurant happy and full! 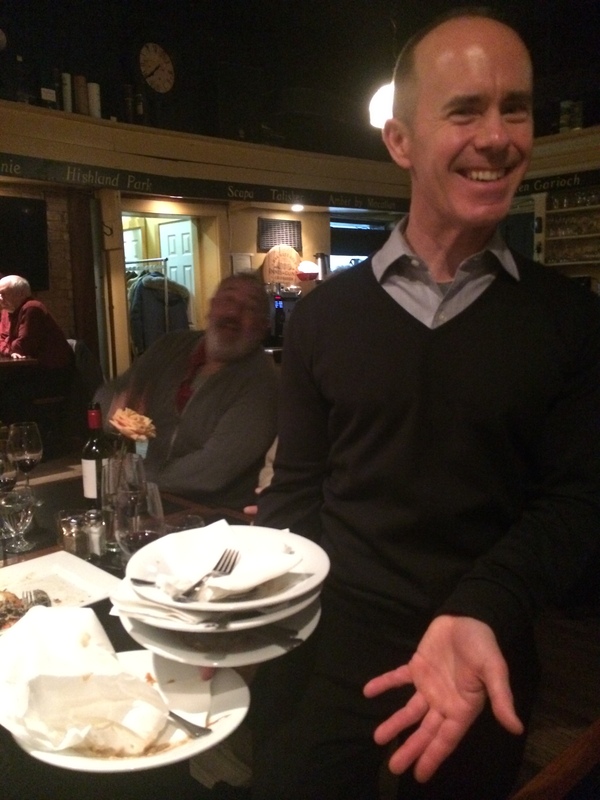 Our waiter Jan holding all of our empty dishes. The taste of Huron winter dining menus run until Feb. 28 and you don’t want to miss out on these yummy meals.